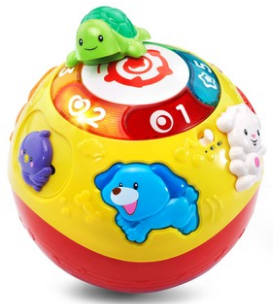 o This interactive ball wiggles and wobbles on its own encouraging little ones to chase after it. o Press the dot, cat, and bear buttons to learn about animals, colors and numbers through more than 45 songs, phrases and sounds. o Five flashing lights spin, twist, and slide. 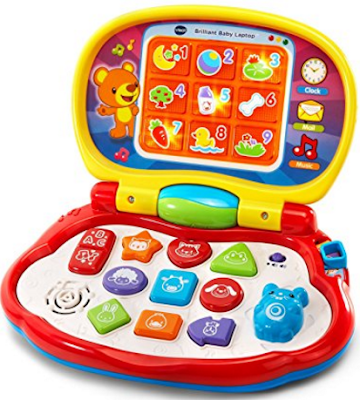 This travel ready laptop features nine brightly colored buttons and a moveable mouse that interacts with the light-up screen. Choose animal mode to learn about animals and their sounds; shape mode to explore colors and shapes; or music mode to hear a variety of songs and melodies. This interactive pet carrier lets little ones take their plush pet anywhere. Put the plush puppy inside or take her out of the carrier and hear playful phrases when opening and closing the door. Press the light-up buttons to learn about colors, shapes, pet care and more. 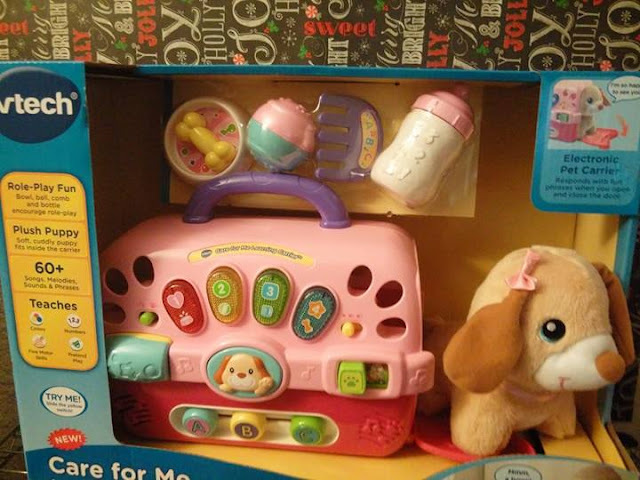 The carrier also includes four pet care accessories so kids can groom, feed and play with their puppy. 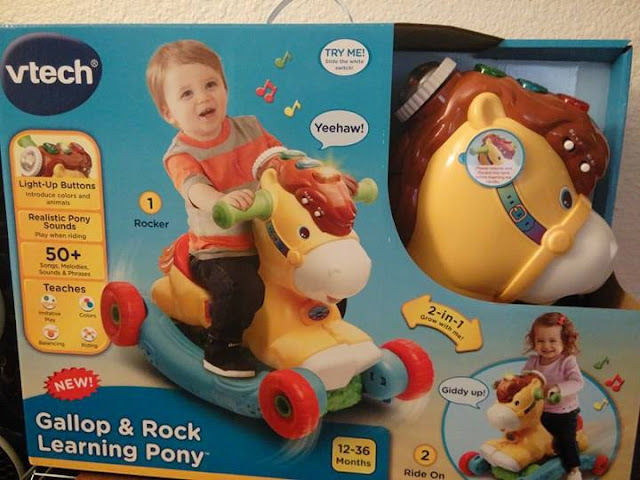 This interactive 2-in-1 pony grows with your child and quickly transforms from a rocking horse to a ride-on toy. Brightly colored buttons introduce colors, action words and play realistic pony sounds. 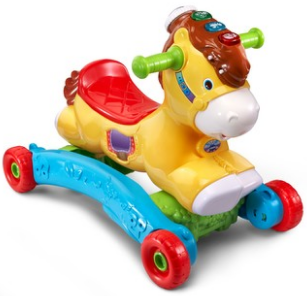 The pony also features a motion sensor that detects children’s movement and responds with cheerful music and pony sounds to encourage them to rock & ride. Our 3 little ones were lucky enough to get to try these 4 "NEW" VTech Learning Toys for the holidays! I love that there is something for every age and each learning toy has levels of growth, so the kids can learn and play in stages of their development. 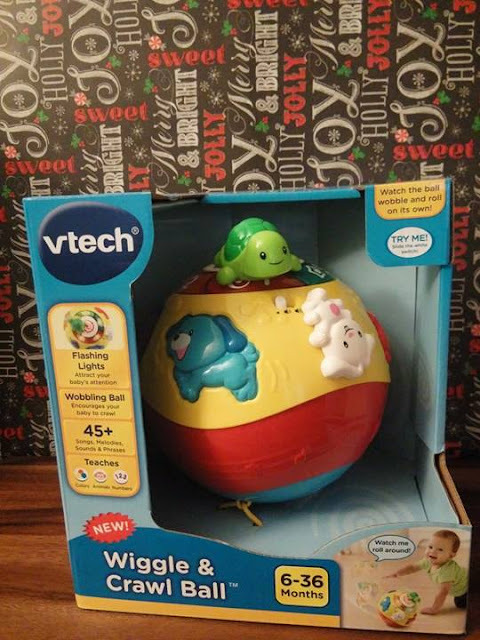 VTech® Wiggle & Crawl Ball™ has 45 songs and so many different ways to play with it that the baby never gets tired of chasing this ball around. He gets a lot of practice crawling and using his fine motor skills and really enjoying himself. 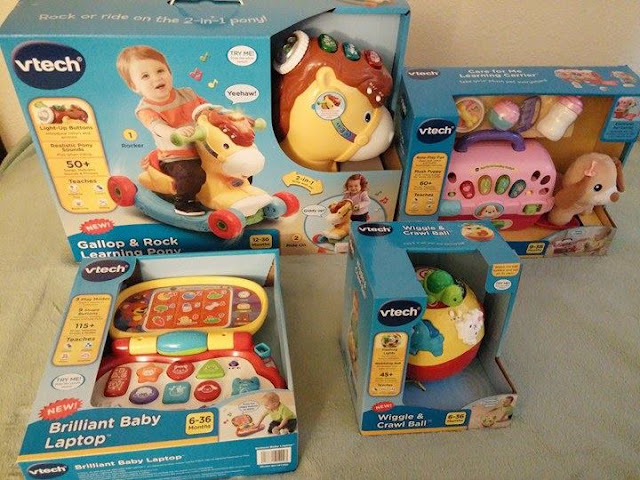 I am not sure who was more excited about this VTech® Gallop & Rock Learning Pony™ because the whole family loves this toy the best! 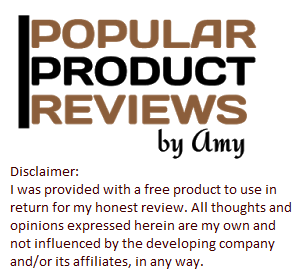 I love the way this toy interacts and reacts when played with, it really encourages fun and movement. I like that it will transition from a rocking horse to a ride on toy. There seems to be endless songs, sounds that delight our little one. The VTech® Brilliant Baby Laptop™ has been taken over by our 4 year old who really enjoys showing her baby brother how to use this baby laptop and learning shapes and colors, etc. They have a lot of fun playing together while the laptop screen lights up and plays songs and phrases. It is colorful and there is a lot to do which keeps them playing and learning in the 3 different modes. All 3 kids love the VTech® Care for Me Learning Carrier™ which comes with a soft little puppy to care for. 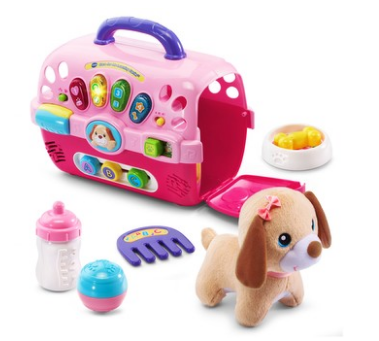 I like how it teaches them about caring for a pet and includes items to use in the care of the little plush puppy. 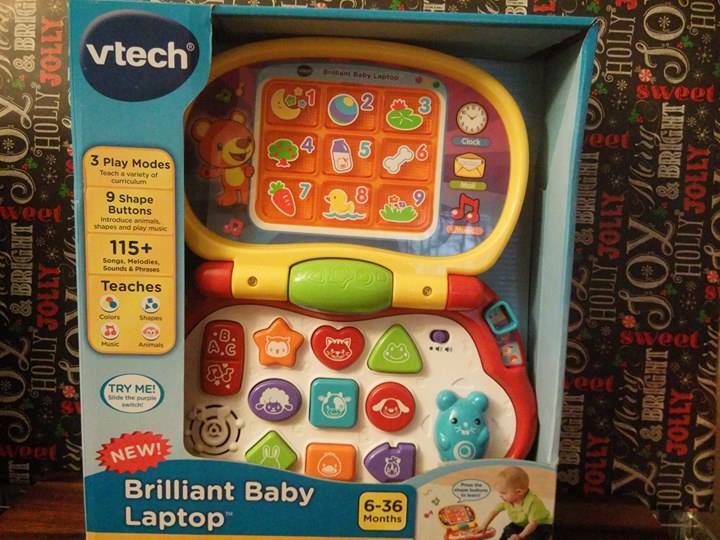 It also teaches colors, shapes and more! I think it's a great first step to owning a pet.